In one of our first visits to Uganda, we discovered Cornerstone Development Africa, a Christian-based organization that is "committed to raising up future leaders with a shared vision of positively transforming their communities and nations.” After meeting with several of the men and women of this ministry who had a passion and education for business, we decided to partner with them by funding a revolving loan program that would help them realize their dreams of being entrepreneurs. ​Since that initial meeting we have seen over 20 businesses created that include poultry farms, real estate development, construction, water filtration, grocery stores, and others. Some of the stories of these businesses are chronicled on this website. Basically, our team has supplied the funding and then returns several times per year to consult with these new owners on accounting, marketing, human resources, spiritual development and other areas as needed. On our Vision trip to Uganda in 2008 we stumbled upon a potential business idea…..providing clean drinking water. After returning to the United States, we began to explore the many methods for providing clean water in the developing world. In Uganda the most common method to clean water was boiling; a very expensive, time consuming and hazardous proposition. After months of research we came up with the idea to transform a seldom used product, the concrete biosand filter, into a highly effective and user friendly product made from durable plastic. Since forming our non-profit entity to launch TivaWater in Uganda, we have delivered over 14,000 filters to provide clean water for over 140,000 people. The Ugandan company is owned and operated by a young Ugandan business leader. Our U.S. nonprofit has delivered filters to Guatemala, Kenya and Haiti. You can learn more about this story on the TivaWater website. For a photo review of the progress of our TivaWater venture, check out the TivaWater Photo Gallery and Video Testimonies. After five years of seeing great success from our poultry farming startups, we began to imagine building a sustainable poultry school where we could leverage our knowledge and empower many more young entrepreneurs. After receiving a generous donation from Fellowship Church to purchase 12 acres of land in the summer of 2012, we had a beginning! 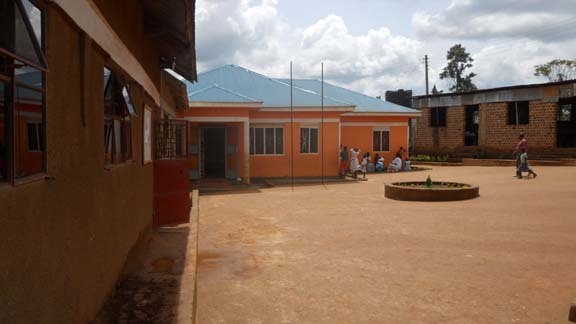 In January of 2013 we began construction of the school that now includes a headmaster home, student housing, classrooms and dining hall, and several poultry houses that hold up 20,000 birds. Our goal is to train several entrepreneurs every year by giving them a real world, hands on experience. We add accounting, marketing, spiritual formation, and human resource training as well. Upon graduation we hope to raise up partners who will finance a new poultry business for each graduate. Since this school will be raising thousands of chickens and eggs every year, we will be using the financial proceeds to pay for the ongoing operational expenses. As one of the largest farms in Uganda we have landed on the brand name, Chicken City Farms, to help market our products. Click here for photos and information about other successful poultry farms we have assisted. One of our first business loans ($4,000) was offered to Sam T to help him expand his small grocery store in a remote village. He used the funds to increase his product offerings including “electricity connections to charge mobile phones” from power that came from solar panels he purchased. Sales flourished and within two years Sam had paid back his loan and now had visions of opening a second, larger store in a town nearby. 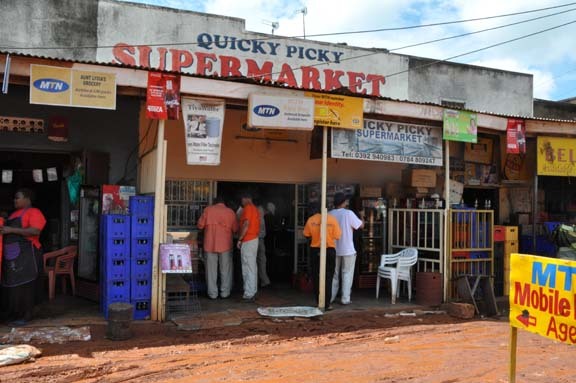 In 2011, Quicky Picky II was birthed from a much larger loan and has been extremely successful. 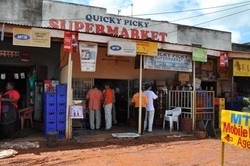 Quicky Picky III was opened in 2013. Our U.S. team provided the working capital and financial and marketing advice, but Sam has invested a huge amount of sweat equity into the business and is the reason it has prospered. He has a vision to grow the Quicky Picky concept to many stores. FOCUS Child Project supports children from the Mulago-Kalerwe slum community in Kampala, Uganda. These children are supported financially through individual sponsorship ($350 a year) so that they have the opportunity to attend school and also be provided with their basic needs. Through various educational programs, FOCUS exposes these children to opportunities that will help them develop spiritually, physically, socially, and economically. Our team was impressed enough with the 20 year track record of this organization and sound leadership that we have actively recruited new sponsors. On our regular visits we are always dazzled by the young men and women we meet who have “graduated” from this program and have been lifted out of poverty. Many return to volunteer on Saturday. To date our friends have sponsored over 100 children. Click here to go to learn more about the FOCUS Child Project. The orphanage (center) was built in 2009. In 2013, we completed a five year agreement assist in the development of orphan, education and medical ministries. During that time, many people from Wakiso and surrounding communities were introduced to Christ through the various ministries conducted by our teams and partners. Following is a brief description of the ministries along with photos and videos. Dove Church of Wakiso is an organization that has a heart for impacting the surrounding community. We were introduced to Pastor Davis Habaasa and wife Grace on our vision trip in 2008 by the World Orphans team. They were looking to create a partnership between a local indigenous church and a U.S. church to help them care for orphans. A year later a house was built and is now home for 14 children. Since that time our group has led five medical clinics at the church (see Medical Clinic Report Videos) and funded the Isaac Clinic with a goal to build a sustainable health care facility that serves the community. Finally we have supported the ongoing efforts of Pastor Davis in growing the campus school, Northlake Academy, by funding the construction of a new brick facility that will accommodate 300 children. Our desire is to see Dove Church grow as a catalyst to bringing spiritual and physical well being to the area. Click here to see photos of the Dove Church Ministry development. Click here to watch video reports of the Medical Clinics.